Um jovem, chamado Walter Becket, desenvolveu uma animação chamada "The Pigeon Impossible", na qual trabalhou durante 4 anos... sim 4 anos. Para quem não viu, vale muito a pena ver. Nessa matéria achei muito interessante o valor que ele dá pra história, porque o parece lógico para muito de nós pra boa parte dos estúdios de animação (e empresas de desenvolvimento de jogos) não é.
Optei por colocar a matéria completa aqui (em inglês), pra evitar que o link se perca. I thought I’d try my hand at one of the more difficult and possibly most controversial things I’ve posted. 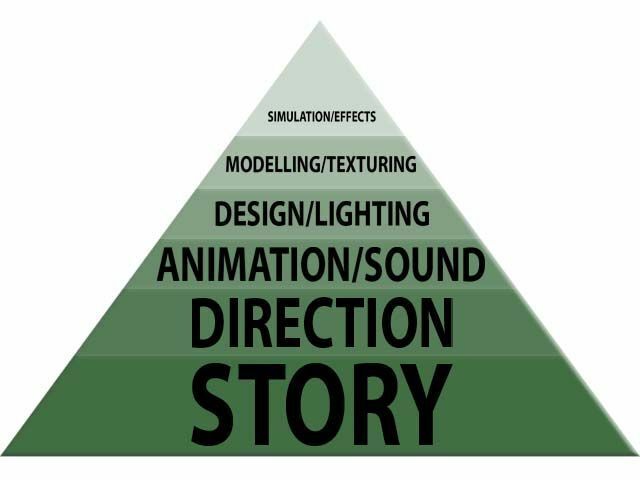 The Animation Pyramid. Essentially, this is a ranking system a la the food pyramid that breaks each part of the process into tiers of importance. The easy one that few people will disagree with is story being at the base. You’ve heard this battle cry echoed a thousand times so I won’t harp on it. However, one thing that often confuses people is the second tier: direction. Another way to think of this is “storytelling” and that’s what the director brings to the table. Much like a comic, a good joke means nothing if the person can’t tell it well. There are even cases where a weak story coupled with strong direction has narrowly saved a film from failure. The best example I can think of was “9.” Pretty much everyone agreed that the story was weak, but the style, tone, and cinematography was so good that it still managed to find an audience. Of course, had the story been stronger, there’s no telling how much better it might have done. The third tier is Animation and Sound (including music, sound design, voice work, etc.) The reason animation claims such an important spot is that the character performances have to be able to connect with an audience. Note that I’m referring more to the raw performance and not so much the technical aspects of weight, arcs, etc. but I could (and might) do a whole other pyramid just on the different aspects of animation. (I include rigging with animation because they’re essentially part of one big process.) Sound is also on this tier because it does so much to convey emotion and mood that it can have just as strong of an effect as animation. I can’t believe how many awesome animations I’ve seen that had cheesy music or really bad sound effects. Its one of the cheapest and easiest ways to add production value to something. In fact, other than final output, our entire budget went into music and sound. Next up, you might be asking why design and lighting take precedence over modelling and texturing. Its true that they’re essentially the execution of the design process, but much like story and direction, a good idea executed poorly is typically better than a poor idea executed well. I actually feel that the design on PI was probably the weakest part, mainly due to my choice to go for a semi-realistic look. We still managed to caricature things slightly, but the visual look of it could have been much more stylized and unique. However, one of the strongest parts was definitely the lighting. In fact a lot of people keep asking about the textures which for the most part are just a single image and maybe a bump map. The reason it feels so tactile is that a lot of time and care went into the lighting and compositing. Even a flat lambert shader can look surprisingly good with the right lighting. The last tier, simulation and effects is the icing on the cake. The reason I put it last isn’t because I hate it, but because it generally takes a huge amount of time to achieve very small increases in quality. Plus, the audience doesn’t typically notice the subtle movements of cloth or the way that particular tendril of smoke twirls. Sure it adds a very cool “wow factor” but unless you’ve nailed all of the other tiers first, this is the last place you want to spend time and money. Now let me have one last opportunity to stave off the hate mail. This is not a ranking of artists or some attempt to set up a caste system. Rather, this is a guide I’ve found useful for keeping a project on track and making sure that time and money is spent in a way that gets the most bang for the buck. Sure, if you’re trying to get a job as an FX TD, you’re not going to care much about story in your reel. But, if you’re trying to make an animation to reach a wide audience, this is the recipe I’ve found works best.